Box Text: Best Selling Game of the Year and Multiple Game of the Year winner. -Fight as a member of U.S. forces and British spec ops in global hotspots to eliminate a well-armed, ruthless force of international seperatists. Take the fights online where persistent stats unlock dozen of customizable weapons and abilities like calling in attack helicopters and fighter jets to dominate your opponents. 11-14-2015 silverbow Box Text Best Selling Game of the Year and Multiple Game of the Year winner. -Fight as a member of U.S. forces and British spec ops in global hotspots to eliminate a well-armed, ruthless force of international seperatists. Take the fights online where persistent stats unlock dozen of customizable weapons and abilities like calling in attack helicopters and fighter jets to dominate your opponents. 04-14-2013 artikskarab Box Text Best Selling Game of the Year and Multiple Game of the Year winner. -Fight as a member of U.S. forces and British spec ops in global hotspots to eliminate a well-armed, ruthless force of international seperatists. 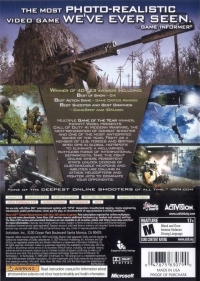 Take the fights online where persistent stats unlock dozen of customizable weapons and abilities like calling in attack helicopters and fighter jets to dominate your opponents. 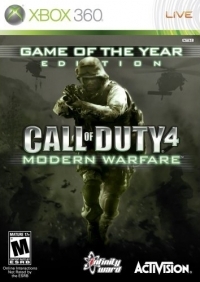 This is a list of VGCollect users who have Call of Duty 4: Modern Warfare - Game of the Year Edition in their Collection. This is a list of VGCollect users who have Call of Duty 4: Modern Warfare - Game of the Year Edition in their Sell List. This is a list of VGCollect users who have Call of Duty 4: Modern Warfare - Game of the Year Edition in their Wish List.